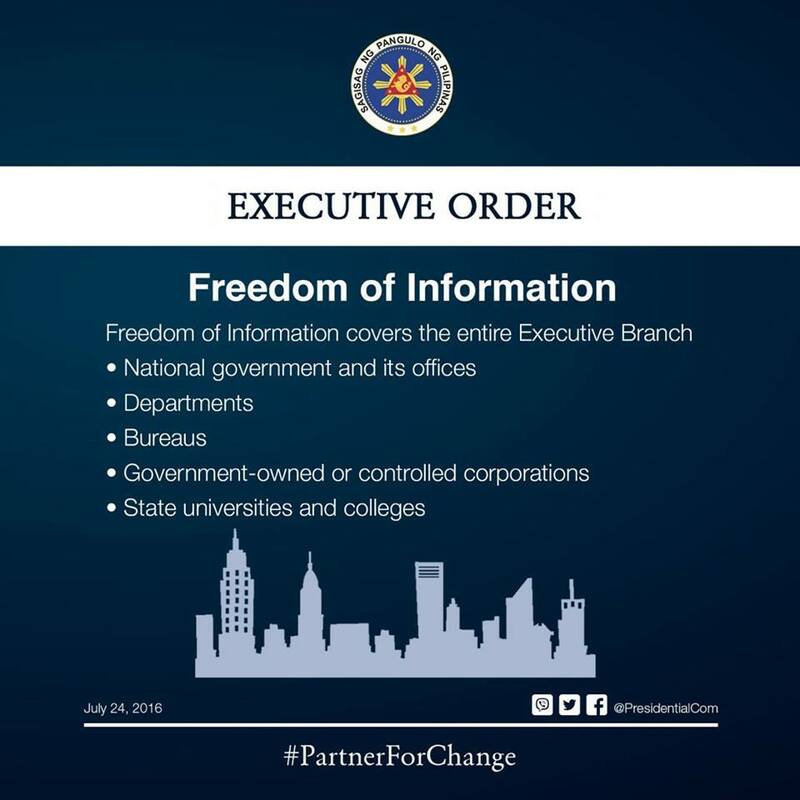 MANILA, Philippines - A day before the first State of the Nation Address (SONA) of President Rodrigo Duterte, the Malacañang Palace through Information secretary Martin Andanar on Sunday announced that the Executive Order on Freedom of Information (FOI) has been signed. Andanar added that Duterte signed the EO on Saturday, July 23 at 7:00 pm. Aside from Andanar, Spokesperson Ernie Abella, and Special Assistant to the President Bong Go were present on EO signing. "This is the centerpiece of President Duterte's platform of good governance. 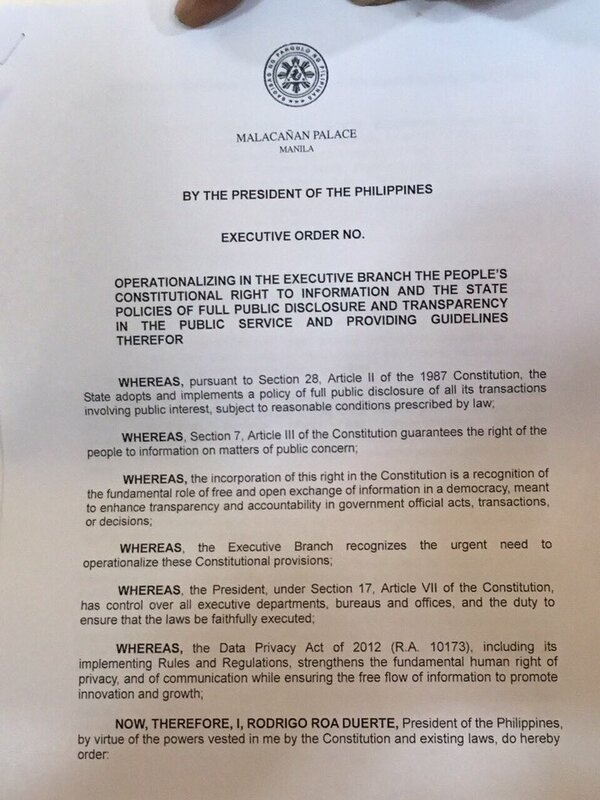 Transparency is now a cornerstone of the Executive Branch, ensuring the public of a government that is by the people and for the people," the Presidential Communications said in a statement on Facebook. Pursuant to Section 28, Article II of the 1987 Constitution, the State adopts and implements a policy of full public disclosure of all its transactions involving public interests, subject to reasonable conditions prescribed by the law. The Executive branch holds a lot of information - which incoming Senate President Aquilino "Koko" Pimentel III estimated at 60 to 70 percent of the total information on government affairs that people must know. 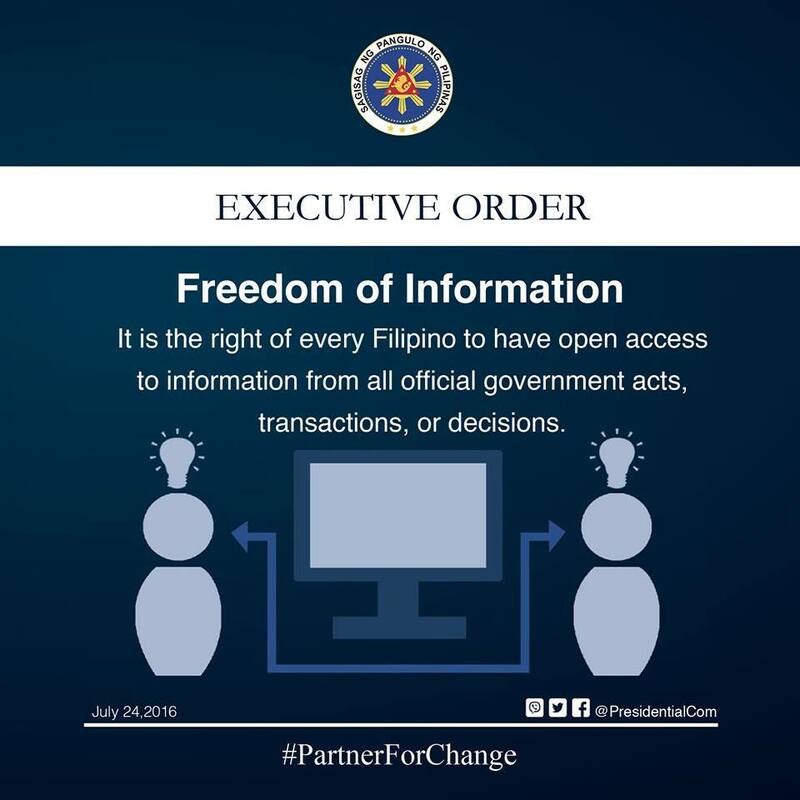 The Executive Order on Freedom of Information explained. 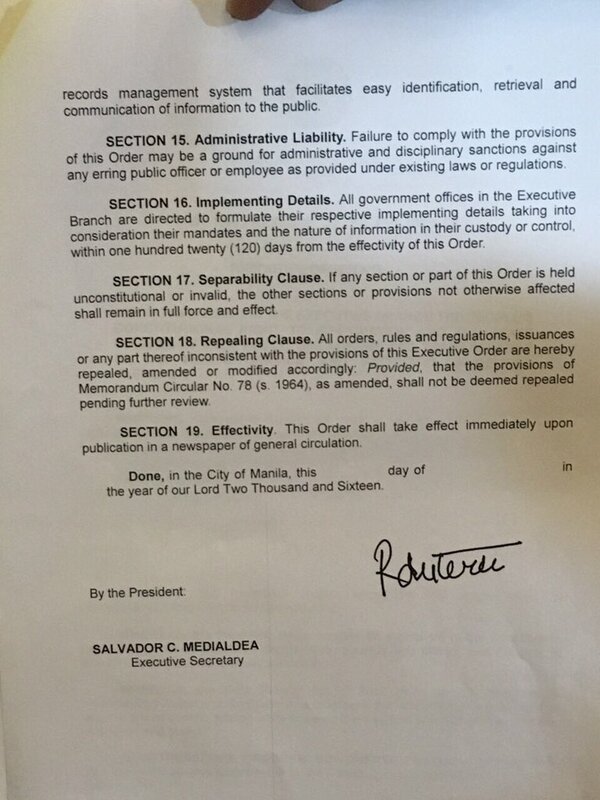 EO is already a good start, even though the law on a full FOI law embracing all branches is pending. On March 10, 2014, the Senate passed the FOI bill on third and final reading, with 22 affirmative votes, no abstention, and no negative votes. On March 4, 2015, the bill passed the Committee on Appropriations and it is awaiting the second reading. The FOI law was stalled in the House of Representatives and will continue despite issuance of the Duterte EO. 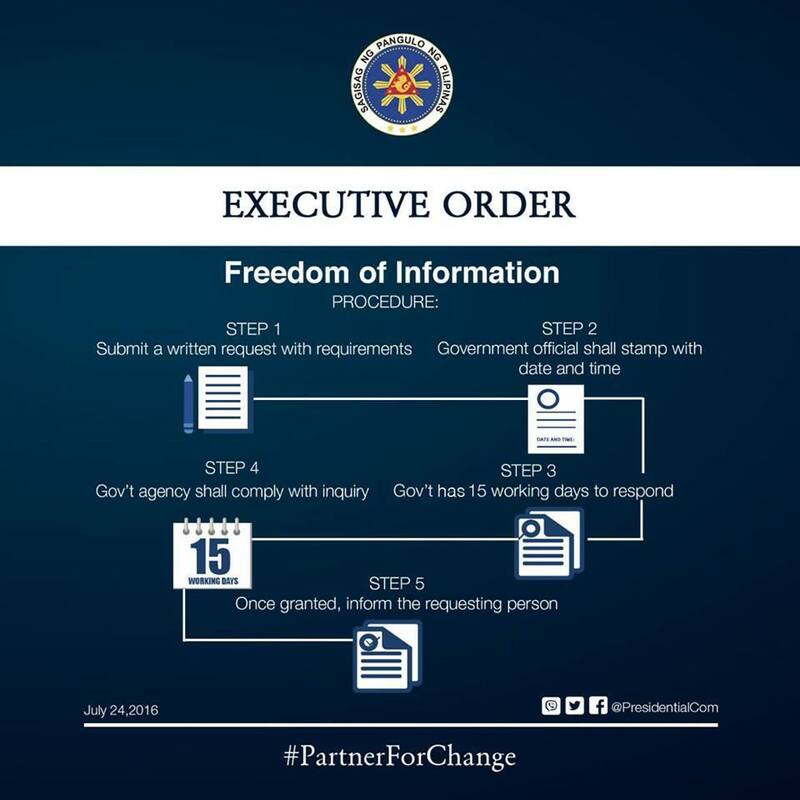 During the administration of President Benigno Aquino III, everyone was hoping the FOI would be passed into law. Unfortunately, despite Aquino’s promise to make the FOI one of his priorities, the passage of the FOI was never mentioned in his SONAs.